Discussion in 'General Discussion' started by John Beef, Dec 17, 2012. Why aren't there more amps in stereo? You have to go rack-based or have multiple heads in order to run a rig in stereo. When I was in high school in the early 90s I had a stereo 2x12 combo, a Fender M-80 chorus. It was a lousy sounding amp because it was all solid state, but at least the idea was there. That's the only self contained stereo guitar amp I have ever seen. I don't know enough about power amp circuitry to say how to make it possible, but wouldn't it be great if guitar amps had say two independent power sections and using a switch on the back of the amp, could either run in mono or stereo? Why don't they build this? You can buy all tube stereo power amps for home entertainment, and there are a few who do it in racks, but you almost never see it anywhere. Why aren't there more amps in stereo? Interesting question. All a stereo amp would be is a stereo preamp and two power amps. It's really just two amps with one set of controls, probably including a balance control. There is no special circuitry involved, as stereophonic reproduction simply requires a stereophonic source, two amps, and two speakers. I'm probably re-hashing what you already are aware of, but thought I should mention it. The main issue is the idea of a guitar being a stereophonic source. It isn't. It's a purely monophonic source. You can run it through effects and have it come out pseudo-stereo, based on the effects, but that's about it. A true stereo signal is recorded by two mics, each picking up the direct and reflected sound nearby, to simulate what your ears hear. In fact, many of the "stereo" records we hear are, with the exception of the drum overheads and room mics, simply monophonic recordings panned to simulate a stereo signal. You can't really have stereo in a single cab. There isn't room for the phantom "center" and the side signals are too close together to do anything. It can work a little with two tiny speakers with a tiny distance between them, but the spread of two larger speakers blends unless they are a few feet apart at least. On larger stages, of course, the amps are miked mono - often several amps summed - and the signals are run through the mixer's effects loops with effects and reverb, again, in a simulation of stereo placement, band on the stage, etc. On smaller stages, when two amps are run to simulate a stereo spread, the guitar player usually puts the cabs on either side of the drums, etc. The problem is that in venues where the audience is not quite far back from the stage, even with close-miking and a house mixer and house speakers, half the audience hears the direct signal from one speaker, and half the audience hears the one from another speaker, and the stereo effect is lost. And by smaller stages, I mean stages where the audience is less than 20-40 feet back, depending on the room. So while it's a cool idea, it's usually lost in translation, and there isn't great demand for it. That, I suspect, is why there aren't stereo guitar rigs on the market today. Wakester, 11top and Rusty Chos like this. Here's Gibsons classic stereo amp the GA-79RVT. It was made to partner with the stereo ES-345 and ES-355 guitars. Separation was achieved by angling the speakers at 45 degrees. It has two independent preamps with their own Volume, Bass and Treble controls. Each channel can be linked and fed together to both of the dual output stages, or fed individually to its own stage and on to its own speaker. The “stereo” aspect comes into play when, for example, a stereo ES-345 is plugged into the TRS Stereo input jack, which routes the neck pickup to one channel and the bridge pickup to the other. Otherwise, the channels can be given entirely independent input signals from two guitars or a stereo effect unit. I used to run a stereo rig, but finding a soundman willing to dig up another 57 was kind of rare, not to mention the amount of clubs that still run their PA in mono. Right on. Thanks everyone, especially Les. At one point I was running two heads into a stereo 4x12, and the stereo output from my delay pedal was running to the FX return of the 2nd head. I wasn't using the preamp section for anything and the only knob that did anything was the volume. It sounded great to me in the bedroom we practice in but I never gigged like that because it was just too much extra stuff to set up. I was thinking it would be cool to have that option in an all in one head. Anyway, just trying to come up with my weekly 6 of clubs thread. There really is a need for this, but there can be more problems. The P22 is basically a sterio guitar ... it has magnetic pickups and the Piezo bridge. There are separate outputs on the guitar. The problem arises because in this case you want the magnetic pickups into a tube amp and the Piezo pups in to an accoustic solid state amp that has a tweeter. I use a Mark V as one channel and the Fishman Loudbox Artist as the second channel. I spoke with Doug Sewell about this situation at Experience. The P22 sounds good just into the Mark V, but with the Fishman, it really comes alive. This is similar to how I use my P22--mags to a tube amp and piezo to the PA. He runs the bass pickup to a bass amp and the treble pickups to a guitar amp. He's not playing the Novax, but a similar updated design. EDIT: Sorry, I know it was somewhat off topic. I'm right there with you on wondering about stereo options. At the risk of getting off topic again, I saw the Mesa Road King 2x12 cab, which is stereo or mono, one closed back and one open. You can run separate inputs into each side, so if you have two sources, you can run stereo. 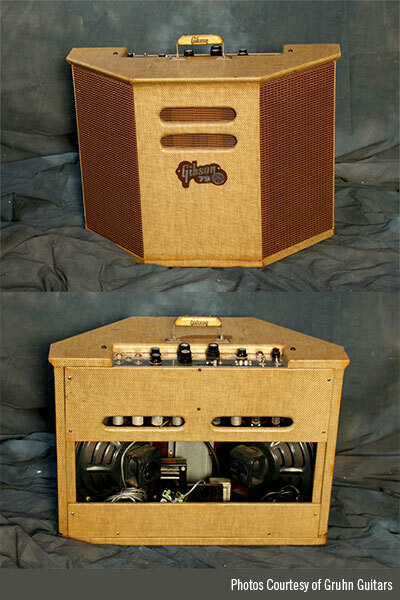 I'm planning on building a hardwood version of this cab, so I can run two separate heads and switch between, with the smallest amount of gear possible. Most of my gigs don't need huge stage volume, so 1x12 at a time would be fine. 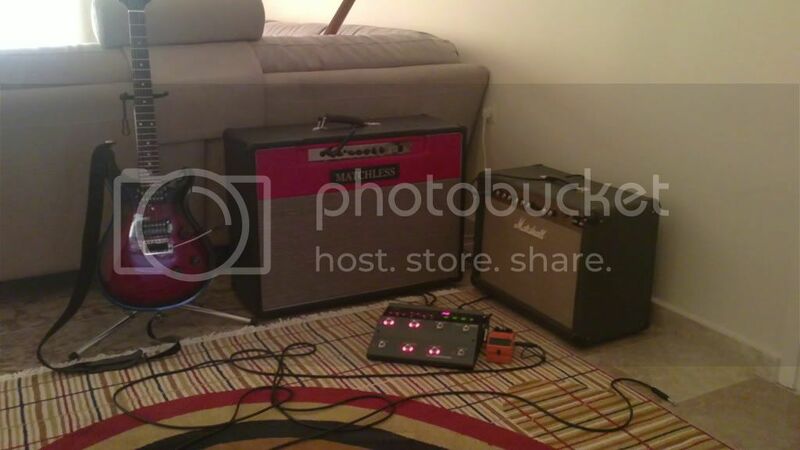 Ken Luker is an amp builder here in Eugene that recently has a stereo amp he's been marketing. Myself I've always liked having a Radial BigShot ABY switch but never with two of the same amps. Right on! That's what I'm talking about. Phaser, Flanger, Chorus, Tremolo, Linear delay, analogue delay, tape delay, multi-delay, room reverb, hall reverb, spring reverb, and plate reverb. It has 3 effects available simultaneously, one from the Modulation choices, one from the delay, and one reverb. The ID Core 40 has 6 voicings, and can dial-in an American sound or a British sound. It has footswitch control available for about $57, and a USB connection to go online and run "Blackstar Insider", an interface to tweak the effects parameters if you want to customize them. I haven't gotten into the Insider, yet, I'm having so much fun with the standard ones. It will easily take acoustic guitar input or electric, has separate Gain and Volume and a very useful Tap speed button. And there are two 6 1/2" speakers side-by-side in a closed-back design and only weighs 10 lbs. My Les Paul weighs 10 1/2! Comes with a carrying strap. Only AC powered; no batteries. The "wart" transformer is over two feet away from the 3-prong AC plug so you don't have any problems squeezing it onto a power strip or conditioner strip. Find a Magnatone Stereo Twilighter. The room filling, 3D effect of that amp is transcendent. Of course, unless the guitar has stereophonic pickups and output jacks, it's simply mono with two speakers. I suppose you could run an effect into one channel and not the other with a splitter box. , or use a stereo effect that, say, bounces delays from one channel to the other. Etc. Listen to the guitar starting around 2:35, that's my Mira, bridge pickup, coil split, running stereo ping pong delay. I want to do that live rather than just mono. First of all, the nature of the guitar is mono. That said, I always like stereo effects. When I was the only guitar player in our jam band, I was running the signal from my TC Nova System to 2 seperate amps, one at each side of the drummer. I used a few millisecs difference in delay times between left and right and it really did the trick. Also: One amp was a Marshall JTM30 (2x5881WXT tubes) 2x10" combo and the other was a Laney LC15R (2xEL84 tubes) into a 2x12"
So I had the same basic sound set from the Nova System, but it had different flavors since it was amplified by two different sounding amps and with a slight difference in delay times. The key IMHO is to have a distance between the speakers to create a nice stereo effect, which you can not achieve with a stereo combo amp. Sage While you were partying I studied the guitar. This one is very intriguing but on 5w per side probably isn't realistic for a gigging musician. I'll bet it would be an awesome studio amp though. That's what I'm talking about!! Only I need MOAR POWER. I have thought many times about just using my head as a preamp and hooking up a Mesa 20:20 rack or something. That said, those Axe FX2s are really, really impressive. Back in the day I was a huge Failure fan, saw them play twice in the 90s and twice now since they reunited. They're using Axe FX2s for both guitar and bass and really nailing those tones they got back in the day. However, I think I would have a very difficult time programming one of those. Paralysis from too many choices. I've always liked stereo in one way, shape or form just to make the sound wider. I think you have to have a slight difference in tone from one side to the other to make it more effective. I pretty much only run verb and delay on one side of my rig so I keep a raw, pure, unadulterated tone along with the wet. Ideally, I'd run W/D/W...that would be fun, but I already haul way too much gear. You could do that if you bought the 20/20 but have to haul 3 cabs. edit:I don't dig stereo cabs. Unless its built with a true divider in the cab, I don't think it sounds good. Even then, I'd rather hear 2 separate cabs.